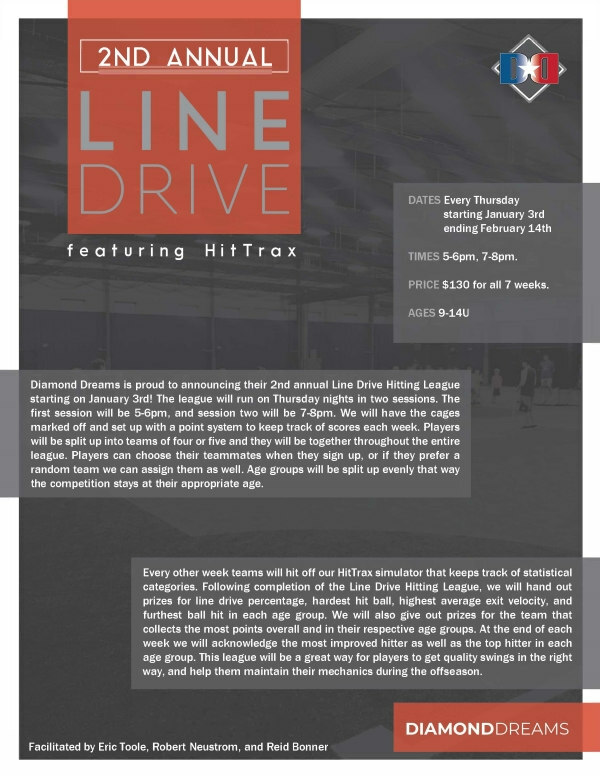 Diamond Dreams is proud to announce their 2nd annual Line Drive Hitting League starting on January 3rd! The league will run on Thursday nights in two sessions. The first session will be 5-6pm, and session two will be 7-8pm. We will have the cages marked off and set up with a point system to keep track of scores each week. Players will be split up into teams of four or five and they will be together throughout the entire league. Players can choose their teammates when they sign up, or if they prefer a random team we can assign them as well. Age groups will be split up evenly that way the competition stays at their appropriate age. Every other week teams will hit off our HitTrax simulator that keeps track of statistical categories. Following completion of the Line Drive Hitting League, we will hand out prizes for line drive percentage, hardest hit ball, highest average exit velocity, and furthest ball hit in each age group. We will also give out prizes for the team that collects the most points overall and in their respective age groups. At the end of each week we will acknowledge the most improved hitter as well as the top hitter in each age group. This league will be a great way for players to get quality swings in the right way, and help them maintain their mechanics during the offseason. Facilitated by Eric Toole, Robert Neustrom, and Reid Bonner.